Usually considered native west of Michigan; not collected in the state until 1902 (Emmet and Kent Cos.) and 1903 (St. Clair Co.); it was already on Isle Royale by 1910. The fruits lack thorn-like protuberances below the beak, or at least some of them are poorly developed and blunt. 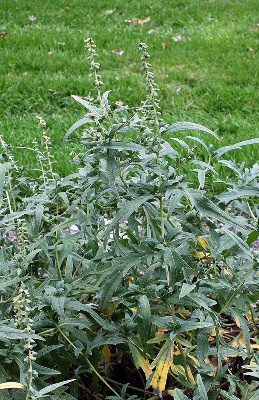 The longer, denser hairs on the leaves give the plant a decidedly gray-green aspect, quite noticeable in the field, contrasting with the darker green aspect of A. artemisiifolia. Hybrids with A. artemisiifolia are relatively widespread in Michigan, and have been named A. ×intergradiens W. H. Wagner. Also perennial, the hybrid often closely resembles A. psilostachya, but tends to be intermediate in several respects, especially intermediate pubescence on the leaves. In the field, the hybrid usually exists in a clone near the parent species, making it more readily distinguished. MICHIGAN FLORA ONLINE. A. A. Reznicek, E. G. Voss, & B. S. Walters. February 2011. University of Michigan. Web. April 21, 2019. https://michiganflora.net/species.aspx?id=214.